An articulated dump truck, sometimes referred to as an “articulated hauler” or “dump hauler,” is a heavy equipment vehicle with all-wheel drive excellent for off-road usage. It is commonly used for Mining, Quarries, Construction, Forestry. The articulated dump truck is excellent for hauling over rough terrain. They handle well on inclines and slipper conditions, and are larger than regular dump trucks. Because of this, they are well-suited for construction and hauling areas such as quarries or mines where the site is rugged. Articulated trucks also have many specialty body options for water loads, services and dumping, and forestry. Articulated dump trucks are made of two units: the tractor and the dump body, or hauler. The tractor is on the front of the truck while the dump body is hauled behind it. Hydraulic rams pivot the front in relation to the back meaning that all the wheels go in the same direction. Because the tractor and trailer are hinged together and controlled by hydraulic rams, the vehicle can make small radius turns. These vehicles usually run at a slower speed, but recent changes in axle differentials has allowed it to operate at higher speeds. Articulated dump trucks usually have a front axle and twin rear axles. Some machines come with hoist cylinders and have options for standard and long wheel base. Evaluate your needs to determine what type of work you are doing, how heavy the loads are that need hauled, and over what distance will the load be moved. Articulated dump trucks can only carry small loads, up to 50 metric tons. They are capable of hauling on roadways without violating weight limit laws, though. Contractors need to focus specifically on payload capacity for articulated dump trucks. It is important that you can have a high production per man hour. Determine what specifications and options are available on the truck to meet the industry standard four to six passes per load. You will need to assess whether you will be going short distances or long distances to determine the appropriate speed for an articulated truck. High-end speeds are better for long hauls while short distances will be fine for lower speed vehicles. To maximize your ROI, check the fuel efficiency of the articulated dump truck, but know that the way the vehicle is operated plays a big role in making your gas go longer. Plan the route, keep distances short, maintain a clean route, and keep the truck maintained to increase fuel savings. There are several popular manufacturers in the backhoe market including John Deere, Caterpillar, Doosan, Volvo, Terex, and Komatsu. 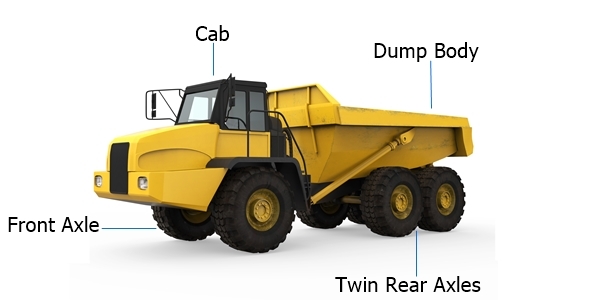 Looking to compare articulated dump truck models side-by-side, from either the same manufacturer or competing manufacturers? RitchieSpecs allows you to compare the dimensions, specifications, and operational aspects of over 140 articulated dump truck models. Once you’ve found the articulated dump truck model that fits your needs, browse articulated dump trucks for sale on IronPlanet and Ritchie Bros Auctioneers.